If you don’t recognize Delia LoSapio ’19, it might be because she’s been a blur on campus over the past three and a half years. Between having her biomedical science major and three minors, playing goalie for the soccer team, serving as captain of the University’s EMS squad, being part of Westover Honors and six honor societies, studying abroad in Africa, and doing — and publishing — scientific research, it’s fair to say the senior from Raleigh, North Carolina, has been busy. So, it also should come as no surprise that LoSapio was named the University of Lynchburg’s 2018-2019 Richard Clarke Sommerville Scholar. 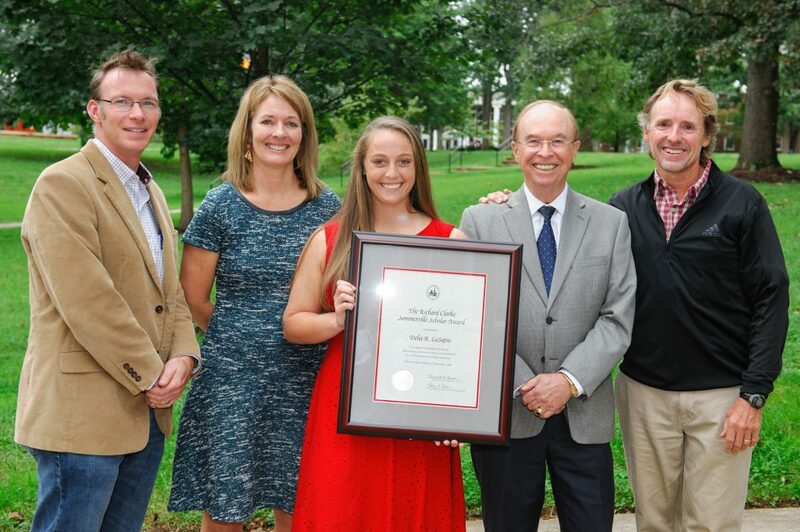 The annual award, the University’s highest academic honor, was presented on Monday, September 24. According to the faculty committee that selects the Sommerville Scholar each year, the 2018 choice was a tough one, but LoSapio and her many accomplishments stood out from the rest. “Though a large number of well-qualified students applied for the Sommerville Scholar award this year, the committee felt that Delia stood out in several ways,” committee chair Dr. Jill Lucas said. “First, the breadth of her intellectual curiosity is evident through the three minors she will complete, all of which vary drastically from her biomedical science major. 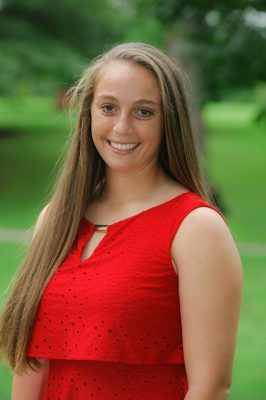 Second, Delia has embraced a wide variety of available opportunities while a student at Lynchburg, including athletics, Westover, EMS, study abroad, internships, research, and service learning. In addition to her biomedical science major, when she graduates next spring LoSapio will earn minors in health promotion, gender studies, and history. With the exception of the semester she took 22 hours — 14 at Lynchburg and eight for her EMT certification at a community college — LoSapio has taken 18 hours each semester. Her current overall grade point average is 3.92. Asked about how she manages such a rigorous academic schedule, LoSapio shrugs it off. “For me, it’s about making the most of every class I take and learning something new every day,” she said. One of the service opportunities LoSapio has taken advantage of since coming to Lynchburg was traveling with Dr. Olsen and the women’s soccer team to Kenya and Uganda in 2017. Dr. Olsen travels there regularly with Sports Outreach Institute, a sports ministry committed to reducing human suffering. In Africa, the team conducted soccer camps and assisted with humanitarian work, including health education. They also sponsor the education of 14 African girls with fundraisers that include penny drives and partnerships with Chipotle. For LoSapio, who plans to go to medical school after graduating from Lynchburg, the experience was inspiring. Honorable mentions for the Sommerville Scholar award also were announced on September 24. Those recognized included Lilli Altenburg, Kathryn Roderick, Mihika Corodimas, and Samah Rash.